The 26th of June marked International Day in Support of Victims of Torture. Many people in Australia have been victims of state sponsored torture, including the many refugees who have fled brutal violent regimes, and David Hicks and Mamdouh Habib who were tortured whilst in U.S. custody. 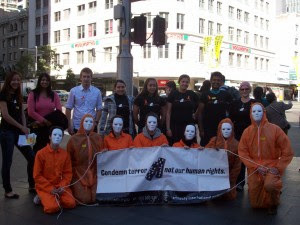 Today, please spare a thought for the the 170 men who still remain detained in Guantanamo Bay- think of what it would be like to be separated from your family for almost 10 years, think of what it must be like to be subjected to beatings, cold rooms, stress positions, 24 hour lighting, loud noises, brutal interrogations, and a constant state of fear. Think about what it would be like to have everything taken away from you- including your basic human rights- and have no way of challenging your torture because you have been prevented from seeking a hearing in normal courts- not because you have been charged or convicted of any crime, rather, because of what you have been accused of. This is the position that all detainees in US custody are in, including those held at Bagram airbase and other military prisons. Torture is about inflicting silence on its victim- it is about removing the voice of the person who has been violated. History has shown us that the credibility and character of torture victims are always torn apart so that doubt is cast over their claims of violence. They become publicly discredited, vilified and dehumanised to ensure that the public loses their outrage at what has been done to them. The torturers release statements that ensure the ‘humane treatment’ of their captives and reiterate a commitment to human rights whilst in hidden back rooms human beings languish in misery and suffering. This is what torturers do so that they remain unaccountable for their actions- this is how they continue to get away with this most horrible of crimes. Members of The Justice Campaign remain opposed to torture of any kind and refuse to remain silent about torture. We believe that there is no excuse to torture another human being and those who sanction torture, condone it, cover it up or are complicit, must be held accountable as universally recognised human rights law dictates. We must stand together and make our voices heard as silence is torture’s greatest strength. I served 25 years in the US Air Force, I was the Chief Prosecutor for the Terrorism Trials at Guantanamo Bay for more than two years, and now I need your help. I personally charged Osama Bin Laden’s driver Salim Hamdan, Australian anathema David Hicks, and Canadian teen Omar Khadr. All three were convicted … and then they were released from Guantanamo. More than 160 men who have never been charged with any offense, much less convicted of a war crime, remain at Guantanamo with no end in sight. There is something fundamentally wrong with a system where not being charged with a war crime keeps you locked away indefinitely and a war crime conviction is your ticket home. As of April 29, 2013 – 100 of the 166 men who remain in Guantanamo are engaged in a hunger strike in protest of their indefinite detention. Twenty-one of them are being force-fed and five are hospitalized. Some of the men have been in prison for more than eleven years without charge or trial. The United States has cleared a majority of the detainees for transfer out of Guantanamo, yet they remain in custody year after year because of their citizenship and ongoing political gamesmanship in the U.S.
That is why I am calling on Secretary of Defense Charles Hagel to use his authority to effect cleared transfers from Guantanamo and on President Obama to appoint an individual within the Administration to lead the effort to close Guantanamo. Obama announced on April 30 that he plans to do his part to close Guantanamo, but he has made this promise before. Now is the time to hold him to his promise and urge him to take the steps necessary to dismantle Guantanamo Bay Prison. If any other country were treating prisoners the way we are treating those in Guantanamo we would roundly and rightly criticize that country. We can never retake the legal and moral high ground when we claim the right to do unto others that which we would vehemently condemn if done to one of us. It is probably no surprise that human rights and activist groups like the Center For Constitutional Rights, Witness Against Torture and Amnesty International have been outspoken critics of Guantanamo. It may surprise you that a former military prosecutor and many other retired senior military officers and members of the intelligence community agree with them. The Patriotic thing, the American thing, the Human thing to do here is to Close Guantanamo. Please join us in the fight by signing this petition.